Photo by Global Marine Exploration, Inc.
Two years after a U.S. salvage company announced finding a wrecked ship off Cape Canaveral, Florida, that had three bronze cannons — each worth more than $1 million — and beautiful marble monuments, a Florida judge has ruled that the submerged wreck and its artifacts are the exclusive property of the nation that built the ship and set it to sea in the 16th century: France. 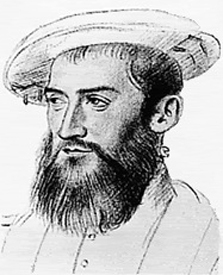 The ship is believed to be one of a fleet of French ships, led by the explorer Jean Ribault, which sailed to the New World to form colonies in America in 1562 and 1565. The Florida marine salvage company Global Marine Enterprises (GME) that located the wreck did not, of course, want to lose the rights to it, and argued that the identity of the ship couldn’t definitively be established. Moreover, GME theorized that “Spanish raiders had looted the cannons and monuments from the early French colony at Fort Caroline in Florida in 1565 — and so, they were on board a Spanish ship, probably bound for Cuba, when the ship went down off the Florida coast,” according to Fox News. The magistrate of the U.S. Federal Court didn’t agree. The court ruled that the found ship is very likely La Trinite, the 32-gun flagship of French captain Jean Ribault. The disaster of Ribault’s fleet gave France’s rival, Spain, the opportunity to strengthen its hold on Fort Caroline and claim Florida for Spain and its ruler, Philip II. One historical theory is that Ribault was in that area trying to reinforce a French colony in what is now Jacksonville. France was in the middle of violent religious wars between Catholics and Protestants at the time. Ribault was a Huguenot navigator who was trying to establish a Protestant colony in the southeast region of America. In 1562 Ribault led an expedition that founded the outpost of Charlesfort in present-day South Carolina. When he later tried to strengthen the colony in Florida, violence broke out. Ribault and some of his men survived the hurricane that wrecked the ships and made it to the coast, but they did not survive the Spanish. When the Catholic soldiers learned he was a Protestant, Ribault was killed on October 12, 1565, in a massacre. 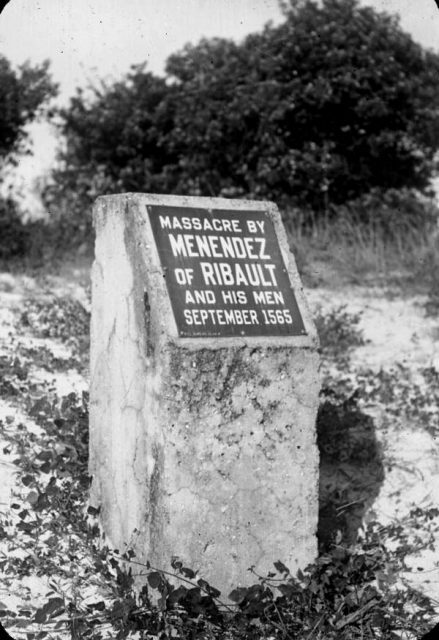 Marker at Fort Matanzas National Monument showing the location where Jean Ribault and his men were slaughtered by Pedro Menéndez de Avilés in September 1565. Glass negative. Now Ribault’s flagship is the subject of tremendous excitement. The ship has “three bronze cannons with markings from the reign of King Henri II, who ruled right before Charles IX; and a stone monument with the French coat of arms that was to be used to claim the new territory,” reports the Daily Mail. Finding La Trinite has been a dream for years. Several years ago, an expedition from the state-run St. Augustine Lighthouse Archaeological Maritime Program attempted to locate the wreck but failed. 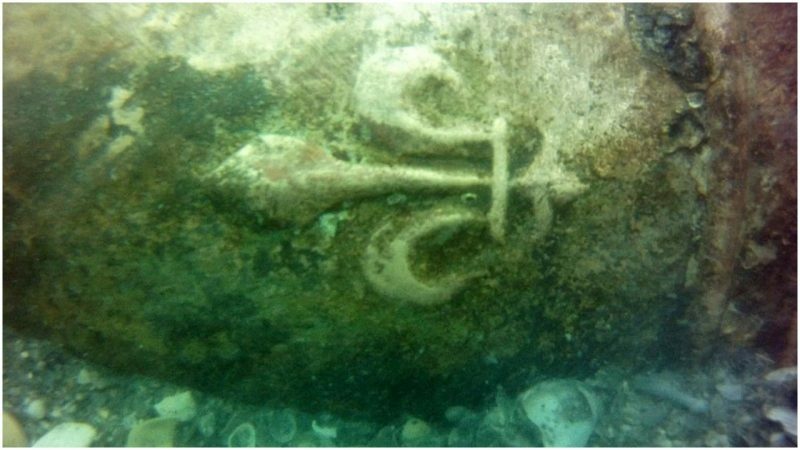 Marine archaeologist Chuck Meide, who led that trip, said of the later success “this is one of the most important shipwreck discoveries we have had in Florida,” according to the Daily Mail. GME, which succeeded in finding the wreck, is unhappy with the court’s ruling. Robert Pritchett, the owner of GME, says “he has invested $3 million in this gig and now runs the risk of getting nothing for his trouble,” according to media reports. “It is not a French military vessel. Tell France to prove it. They cannot. I can tell you France has no proof of anything,” said Pritchett. French authorities, who do not want to disclose exactly where the wreck is, call the find a major discovery that deserves careful and rigorous analysis. James Goold, the attorney representing the French government, told the press that the July 2018 ruling will protect artifacts from the wreck from being privately salvaged.